Each year on the final Monday in May the United States celebrates the federal holiday Memorial Day. Originally Memorial Day was known as Decoration Day, meant to honor the Union and the Confederate soldiers who died during the American Civil War. By the 1900s it had become a day to celebrate all American soldiers who died while serving in the military. It wasn’t until 1967 that it was legally named Memorial Day. It became a federal holiday in 1971. · The true origins of who held the first Memorial Day celebration is a debated subject. · Approximately 620,000 soldiers on both sides died during the Civil War. · The Grand Army of the Republic was created by the Union Army to honor their dead. After World War I the American Legion took over their duties. 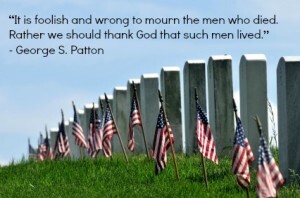 · Congress passed a law in 2000 that requires all Americans to stop what they are doing at 3pm on Memorial Day to remember and to honor those who have died serving the United States. President Clinton signed this action. · The flag is supposed to be flown at half-mast until noon, and then raised to full mast until sunset on Memorial Day. · The tradition of wearing red poppies on Memorial Day originated from John McCrae’s 1915 poem In Flanders Fields. In Canada they wear red poppies to honor their soldiers on Remembrance Day in November each year. · Although not as popular today, one tradition was to eat a picnic meal while sitting on the ground of a cemetery. There are still some people in the rural areas of the South that continue to practice this tradition. · It’s common for volunteers to place the American flag on graves in the national cemeteries. Memorial Day is also a popular day for people to visit cemeteries and honor those who have died while serving in the military. · It’s estimated that approximately 32 million people travel by car over Memorial Day weekend. · Memorial Day also marks the beginning of the summer vacation season while Labor Day marks the end. · In some areas of the rural South, they hold annual Decoration Days around this time for certain cemeteries, often in the mountains. · Memorial Day is sometimes confused with Veterans Day. However, Veterans Day honors all United States military veterans, while Memorial Day honors the soldiers who died while serving. · In 1966, President Johnson named Waterloo, New York as the original place of Memorial Day. · There were more American lives lost during the Civil War then the two World Wars combined. Approximately 620,000 died during the Civil War while approximately 116,516 died in World War I and approximately 405,399 died in World War II. · There are more than 300,000 fallen soldiers buried at Arlington Cemetery. On average, there are 28 burials there each day. · Alabama, Georgia, Louisiana, Mississippi, North and South Carolina, Tennessee, Texas and Virginia celebrate Confederate Memorial Day. These are former Confederate states, and they celebrate on various other days ranging from January 19th to June 3rd. · In 2012 there was a movie made called Memorial Day. John and James Cromwell and Jonathan Bennett starred in the film. The story revolves around a 13 year old boy who finds his grandpa’s footlocker from the 2nd World War. Happy Mother’s Day from Copperfield Hill – Enjoy the Sunshine! May is a month full of people and events to celebrate. One of the most obvious of these, is Mother’s Day. This day is known widely as a time for family brunches, special gifts, sentimental cards and general outpourings of appreciation and love. However, it is rooted in more somber beginnings. Before the Civil War, a West Virginian woman named Ann Jarvis organized women to improve sanitary conditions and milk contamination to help fight infant mortality. These groups also tended to wounded soldiers during the Civil War. Post war, Ann Jarvis organized Mother’s Friendship Day picnics and other events as pacifist strategies to unite former foes. With others supporting her efforts, this was a time when many women began to be active in a political role, promoting peace. Ann Jarvis’s daughter, Anna, followed in her mother’s footsteps to continue efforts to unite and celebrate “the best mother you have ever known”. She stressed the singular “Mother’s Day” not “Mothers’ Day”. Try as she did to keep consumerism out of the picture, she failed. Many organizations used Mother’s Day as a platform to raise money for charity. This continues today. In 1914, President Woodrow Wilson officially set aside the second Sunday in May for the holiday. So, there you have it. A little bit of history about Mother’s Day. We wish each and every mother out there, and they come in many forms, a very happy, healthy and blessed Mother’s Day. If you are in the Minneapolis area, get out and enjoy the sunshine. It is suppose to be beautiful! Copperfield Hill Hosts 2nd Annual Health and Wellness Resource Fair! Maser Amundson Boggio Hendricks, P.A. There will be a plethora of information that pertains to living life to the fullest. Come join us!